Whatever It Takes? - Live Life Revolution | Stop Existing. Start Living. The good news is you don’t have to give everything or even worse die trying. I have been successful on many levels of my life, and I have not sacrificed any of the important stuff that I hold dear. 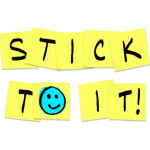 So what makes some people move forward while others can’t seem to get unstuck? You have to know what you want — that’s finding your desire. You also have to believe that you should and can do the things you want to do. But, if you are not determined to move forward despite the obstacles that get in the way, despite the fact that your journey may become harder than you ever imagined, you will get stuck and possibly stop all together. Determination is crucial to success. Determination is not about winning at all costs. The next time you are asked what you’re willing to do for something, answer honestly. Don’t just give one of the standard answers above. It’s unwise and unfair to yourself to blindly commit to doing anything to succeed. What’s more important than saying what your willing to give, is to understand what you’re not willing to give. I am not now, nor have I ever been willing to sacrifice my family for success. My wife and kids have always come first. There were times early on in our family life that I was working 80 to 90 hours a week — week in and week out. Even with that kind of workload, I still never missed my son’s football games or my daughter’s performances at dance class. I have never missed a birthday party for either of them and only once was I away from my wife on our anniversary in 25 years. Knowing what you will not be willing to give will allow you to answer honestly and truly know what you are willing to do for success. Being determined creates persistence. Your persistence will be what keeps you moving when things get hard — and things WILL get hard. Anything worth having is worth working for, and you have to work to succeed. Your determination will allow you find ways to go over, around or through obstacles that pop up. When you’re determined to do something you will move on, even when things go wrong or get difficult. When your body, mind and emotions tell you to quit, determination will see you through. Being determined keeps you focused. Inevitably, when you start working towards one goal other things will pop up and try to steal your attention. Being determined will help you sidestep or even look over those pesky interruptions and keep your focus right where it needs to be — on completing your goals. Being determined makes it more satisfying in the end. We all love a sense of accomplishment — the feeling that you’ve obtained something you’ve worked hard for. There is no better feeling in the world then to know you set a goal, created a plan, overcame every obstacle in your way and successfully completed your journey. Your determination is what makes it possible for you to do what you must do to reach your goals and obtain that all-important sense of accomplishment. I’ve often said that success is simple, but it’s not easy. It takes hard work and determination to succeed, but it’s worth every ounce of sweat and tears it takes. Use your determination to stay focused, keep your persistence, keep moving, and you will accomplish your goals and LIVE LIFE! Previous Post: Have Faith And Move Forward!